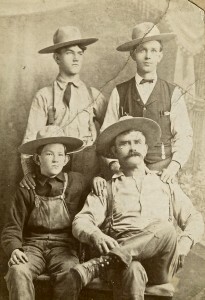 Someone was able gather up the Williams men for this early 1900s shot. Pictured in the back, left to right, is Clyde Williams and Charlie Williams. Front, left to right, is Leon Williams and Nate Williams. Each of these men played a role in the town’s history. If you would like to know more, just click on their names. Photo courtesy of Rich and Ruthie Williams.